It’s dry out here! Today’s pungent harvest: Sweet salad mix, baby arugula, baby and regular spicy salad mixes, arugula, onions, scallions, cilantro, Italian basil, lots of tomatoes, slicers and heirlooms, cherry tomatoes, and the last of the figs for a while. 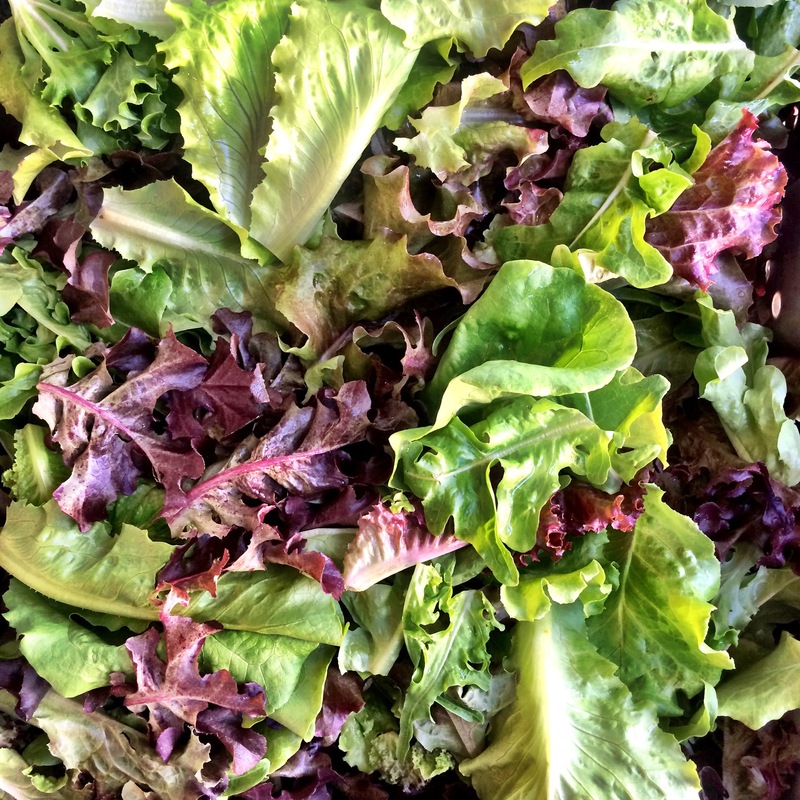 Q: Why aren’t your salad greens as sweet this week as they were last week? Why are the stems larger/smaller? Why isn’t the spicy as spicy as it was last time? etc. etc….? (1) Mother nature’s treatment of our crops is the primary source of this shift in taste from week to week. Even as our recipes remain unchanged, small changes in the weather can affect the taste of our salad mix. When temperatures are hotter during a portion of the growth cycle of the lettuce heads in our fields, they respond as many living beings do under stress: they attempt to defend themselves from being eaten as they try to propagate. Lettuce will tend to take on a more bitter flavor in hot weather as it accelerates toward the bolting and seeding cycle of its life (as it would during hot late summer months in the cooler parts of the world). If we encounter cooler and rainier weather, the lettuce will be sweeter. Even a brief few days of intense heat can alter the taste of plants. And variations in weather now can affect the salad flavor two or three weeks from now, as the plants are in their growth cycle. Spicy greens become more peppery when the weather is very hot and dry, and will taste milder when we’ve had a lot of wet weather. Our formulas for the types of greens and their quantities in the various mixes stays consistent from harvest to harvest, but the weather can change the flavors in the bag of salad you take home. 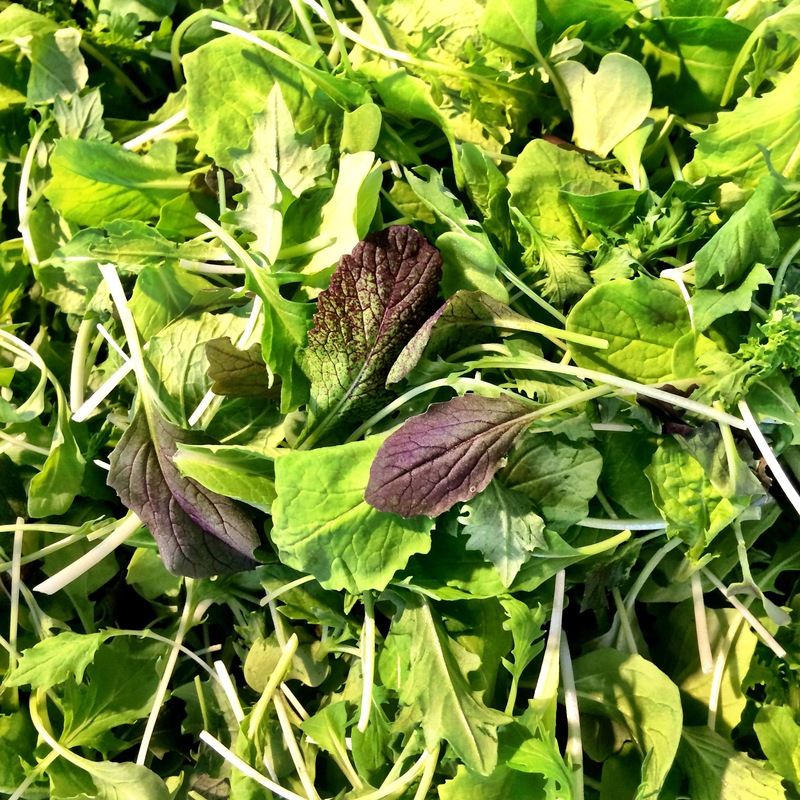 Occasionally we do have to change the formulation of a salad mix because seed is not available for some of the tasty baby greens that add so much flavor to our mixes. We find a substitution that is similar, but this can also change the taste of our salad mixes over the course of the season. (2) The other factor that comes into play in the consistency of ARTfarm salad greens from bag to bag is what we like to call the Jackson Pollock effect. 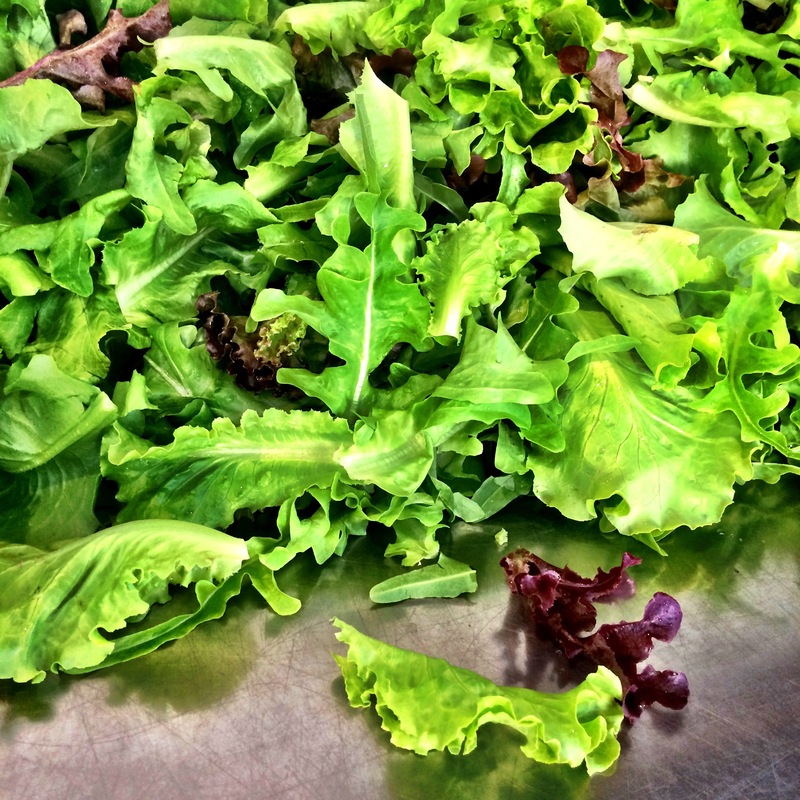 When we make the salad mix we use a very large sanitized stainless surface and mix in many different baby mesclun greens with multiple large chopped lettuce varieties. When creating his splatter paint pop art creations of the 1960s, Jackson Pollock employed a similar technique. He would toss different colors in random patterns throughout his large canvases. What we do next at ARTfarm is essentially like taking that large amazing Jackson Pollock painting and cutting it up into many small pieces. Each portion of the canvas represents a bag of ARTfarm salad mix. Some bags will have more large pieces of stem from the base of the lettuce head; other bags will contain a little bit more of the baby mesclun greens; others will be a perfect blend of all the different ingredients that we put into the salad mix. Every bag is a little different because they’re all prepared by hand, and the weather, the secret intentions of mother nature, and the randomness of our process ensure that your experience will always be fresh! We know that our customers seek us out because they want real produce that tastes like the place it was grown. We know you can handle a little variety. But, if you ever purchase a bag of salad greens from ARTfarm that you find inedible, please bring it back to us. We’d always like to hear from our customers, good or bad, how you feel about our products, and if we’ve goofed and a product is not up to our normal level of quality, we would be happy to replace it with something you find tastier. We grow this stuff for you, after all! Over the sleepy summer and fall break, we grew some cover crops in the gardens at ARTfarm to help improve the soil for next year’s crops. Climbing up the golden dried stalks of harvested sweet corn were some large and very happy cowpea vines (Vigna unguiculata) replete with big green bean pods. 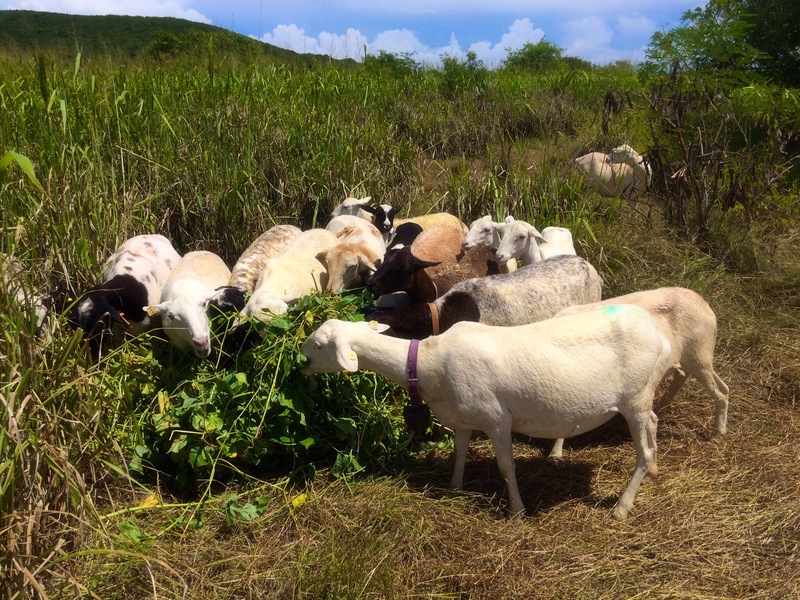 There is almost nothing in this world that our sheep enjoy more than fresh cowpea vines and beans. Friday afternoon we removed the upper part of the cowpea plants and offered them to all three groups of ovines. OMM NOM NOM NOM! Cowpeas are a forage that is high in protein, helping the sheep to grow and put on weight. The roots of the cowpea plants fix nitrogen into the soil. Your ARTfarmers are busy planning next year’s season and preparing garden areas to receive young seedlings. We have been blessed with some beautiful rainfall in September. We look forward to seeing all of you in just a few more weeks when the farmstand reopens. Watch this space! Q: Is ARTfarm food really “organic”? 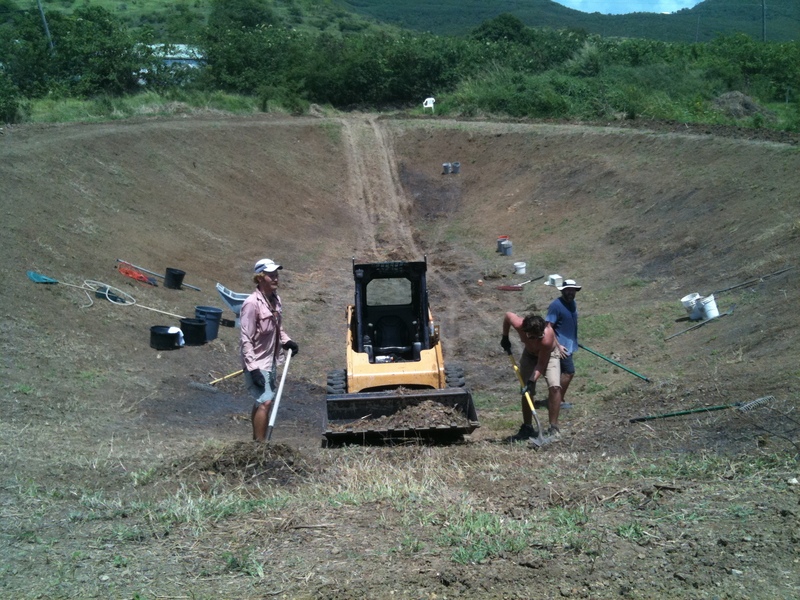 Luca has been farming on St. Croix to the specifications of the USDA’s National Organic Program (which regulates the certification of organic produce and farms in the USA) continuously since 1999. According to the techniques logged in our detailed farm records, we have either met or exceeded the USDA standards for the production of organically grown produce consistently over that entire period. ARTfarm in its current location is situated on pastureland that has been farmed and ranched (free of any chemicals or non-sustainable methods) continuously since the 1700s. However, we have not been certified officially by the USDA as a certified organic farm. Therefore, even though all of our produce is organically grown to USDA Organic specs, we cannot and do not legally claim that any of our products are “USDA Organic”. MANY if not MOST small farms that fall under the jurisdiction of the USDA have chosen NOT to get certified, not because they aren’t practicing organic production techniques, but because it is a lengthy and rather expensive process that for the most part does not justify its expense. Unless you are a large farm growing commodity amounts of a crop to be sold as certified organic for use in packaged products, organic certification with the USDA is a marketing strategy. 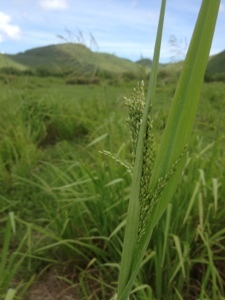 It does not change one’s farming philosophy or choice for or against sustainable techniques. Does it really matter if your produce is: locally grown with organic approved methods, by conscientious people you know personally, or: certified organic by a federal agency? Our position is, yes, and no. We will be open (finally!) in two weeks, Saturday, October 12th! We’ll be welcoming everyone back with lettuce greens, microgreens, basil and garlic chives, and local honey, with cucumbers, beets and arugula soon to follow. It has been so hot this fall that we just decided to delay planting of some things so that the plants would be stronger. Like a turnaround after a long recession, the summer fallow is starting to show signs of life! Things are growing quickly now that we’ve gotten a nice soaking. Summer thunderstorms have blessed us nightly with just enough rain to make the plants happy. Saturday’s Stand – Tomato Preview!! The tomato season is ramping up! Here come the little cherry Ts, sweet as can be! 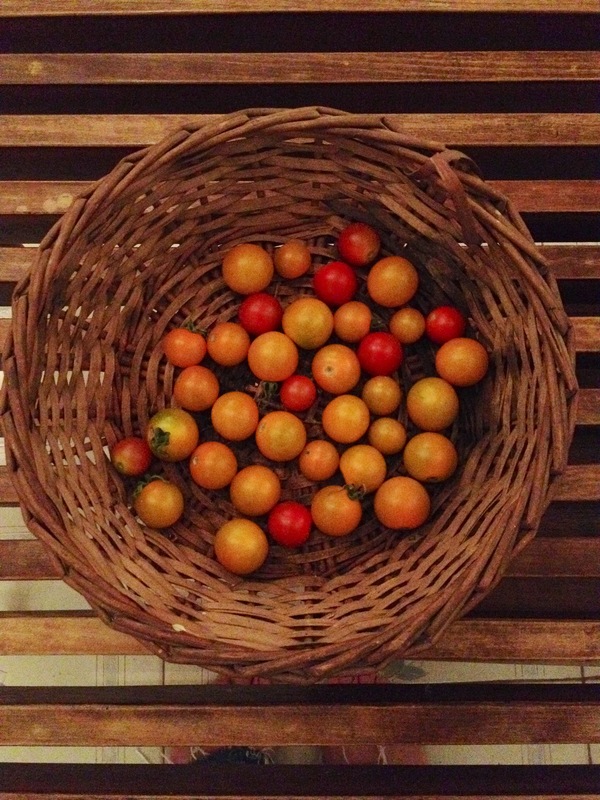 The first two pints of cherry tomatoes will be available at Saturday’s farmstand to the first two lucky customers! Also featuring: kale, collards, italian greens, cooking greens; arugula, teen arugula, microgreens, sweet mix, spicy mix; herbs: basils, lemongrass, garlic chives. For dessert: fresh coconuts, holy basil, papayas, honey and chocolate. Farm gossip and rumors for Wednesday’s stand: CUCUMBERS will be available!! Don’t miss it! !